For other uses, see Austerity (disambiguation). For the current opposition to present-day austerity measures, see Anti-austerity movement. Austerity is a set of economic policies implemented with the aim of reducing government budget deficits. Policies grouped under the term 'austerity measures' may include spending cuts, tax increases, or a mixture of both, and may be undertaken to demonstrate the government's fiscal discipline to creditors and credit rating agencies by bringing revenues closer to expenditures. In most macroeconomic models austerity measures generally increase unemployment as government spending falls, reducing jobs in the public and/or private sector. Meanwhile, tax increases reduce household disposable income, thus reducing spending and consumption. Since government spending contributes to the Gross Domestic Product (GDP), reducing the spending may result in a higher debt-to-GDP ratio, a key measure of a country's debt burden. When an economy is operating at near capacity, higher short-term deficit spending (stimulus) can cause interest rates to rise, resulting in a reduction in private investments, which in turn reduces economic growth. In the case of excess capacity, however, the stimulus may result in an increase in employment and output. A historical example in which austerity measures failed was in the aftermath of the Great Recession, where many European countries implemented such policies: unemployment rose to higher levels and debt-to-GDP ratios increased, despite reductions in budget deficits (relative to GDP). Austerity measures are typically pursued if there is a threat that a government cannot honour its debt obligations. This may occur when a government has borrowed in foreign currencies (that it has no right to issue), or if it has been legally forbidden from issuing its own currency. In such a situation, banks and investors may lose confidence in a government's ability and/or willingness to pay, and either refuse to roll over existing debts, or demand extremely high interest rates. International financial institutions such as the International Monetary Fund (IMF) may demand austerity measures as part of Structural Adjustment Programmes when acting as lender of last resort. According to Mark Blyth, the theories and sensibilities about the role of the state and capitalist markets which underline austerity emerged in the 17th century, but the concept of austerity emerged in the 20th century, when large states acquired sizable budgets. Austerity is grounded in liberal economists' views that state and sovereign debt are deeply problematic. Blyth traces the discourse of austerity back to John Locke's theory of private property and derivative theory of the state, David Hume's ideas about money and the virtue of merchants, and Adam Smith's theories on economic growth and taxes. On the basis of classic liberal ideas austerity emerged as a doctrine of neoliberalism in the 20th Century. Economist David M Kotz suggests that the implementation of austerity measures following the financial crisis of 2007–08 was an attempt to preserve the neoliberal capitalist model. Red: corporate profits after tax and inventory valuation adjustment. Blue: nonresidential fixed investment, both as fractions of U.S. GDP, 1989–2012. In the 1930s during the Great Depression, anti-austerity arguments gained more prominence. John Maynard Keynes became a well known anti-austerity economist, arguing that "The boom, not the slump, is the right time for austerity at the Treasury." Contemporary Keynesian and New Keynesian economists argue that budget deficits are appropriate when an economy is in recession, to reduce unemployment and help spur GDP growth. According to Paul Krugman, since a government is not like a household, reductions in government spending during economic downturns worsen the crisis. Across an economy, one person's spending is another person's income. In other words, if everyone is trying to reduce their spending, the economy can be trapped in what economists call the paradox of thrift, worsening the recession as GDP falls. If the private sector is unable or unwilling to consume at a level that increases GDP and employment sufficiently, Krugman argues, the government should be spending more in order to offset the decline in private spending. Economists Kenneth S. Rogoff and Carmen M. Reinhart wrote in April 2013, "Austerity seldom works without structural reforms – for example, changes in taxes, regulations and labor market policies – and if poorly designed, can disproportionately hit the poor and middle class. Our consistent advice has been to avoid withdrawing fiscal stimulus too quickly, a position identical to that of most mainstream economists." To help improve the U.S. economy, they advocated reductions in mortgage principal for 'underwater homes'- those whose negative equity (where the value of the asset is less than the mortgage principal) can lead to a stagnant housing market with no realistic opportunity to reduce private debts). In October 2012, the IMF, International Monetary Fund, announced that its forecasts for countries that implemented austerity programs have been consistently overoptimistic, suggesting that tax hikes and spending cuts have been doing more damage than expected and that countries that implemented fiscal stimulus, such as Germany and Austria, did better than expected. The IMF reported that this was due to fiscal multipliers that were considerably larger than expected: for example, the IMF estimated that fiscal multipliers based on data from 28 countries ranged between 0.9 and 1.7. In other words, a 1% GDP fiscal consolidation (i.e., austerity) would reduce GDP between 0.9% and 1.7%, in so doing inflicting far more serious economic damage than the 0.5 previously estimated in IMF forecasts. In many countries, little is known about the size of multipliers, as data availability limits the scope for empirical research. For these countries, Nicoletta Batini, Luc Eyraud and Anke Weber propose a simple method — dubbed the "bucket approach" — to come up with reasonable multiplier estimates. The approach bunches countries into groups (or "buckets") with similar multiplier values, based on their characteristics, and taking into account the effect of (some) temporary factors such as the state of the business cycle. Different tax and spending choices of equal magnitude have different economic effects: For example, the U.S. Congressional Budget Office estimated that the payroll tax (levied on all wage earners) has a higher multiplier (impact on GDP) than does the income tax (which is levied primarily on wealthier workers). In other words, raising the payroll tax by $1 as part of an austerity strategy would slow the economy more than would raising the income tax by $1, resulting in less net deficit reduction. In theory, it would stimulate the economy and reduce the deficit if the payroll tax were lowered and the income tax raised in equal amounts. The term "crowding out" refers to the extent to which an increase in the budget deficit offsets spending in the private sector. Economist Laura D'Andrea Tyson wrote in June 2012, "By itself an increase in the deficit, either in the form of an increase in government spending or a reduction in taxes, causes an increase in demand". How this affects output, employment and growth depends on what happens to interest rates. When the economy is operating near capacity, government borrowing to finance an increase in the deficit causes interest rates to rise and higher interest rates reduce or 'crowd out' private investment, reducing growth. This theory explains why large and sustained government deficits take a toll on growth: they reduce capital formation. But this argument rests on how government deficits affect interest rates, and the relationship between government deficits and interest rates varies. When there is considerable excess capacity, an increase in government borrowing to finance an increase in the deficit does not lead to higher interest rates and does not crowd out private investment. Instead, the higher demand resulting from the increase in the deficit bolsters employment and output directly. The resultant increase in income and economic activity in turn encourages or 'crowds in' additional private spending. Advocates argue the 'crowding-in' model is an appropriate solution for current economic conditions." 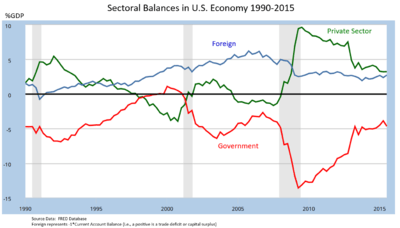 Sectoral financial balances in U.S. economy 1990–2012. By definition, the three balances must net to zero. Since 2009, the U.S. capital surplus and private-sector surplus have driven a government budget deficit. According to economist Martin Wolf, the U.S. and many Eurozone countries experienced rapid increases in their budget deficits in the wake of the 2008 crisis as a result of significant private-sector retrenchment and ongoing capital account surpluses. Policy choices had little to do with these deficit increases. This makes austerity measures counterproductive. Wolf explained that government fiscal balance is one of three major financial sectoral balances in a country's economy, along with the foreign financial sector (capital account) and the private financial sector. By definition, the sum of the surpluses or deficits across these three sectors must be zero. In the U.S. and many Eurozone countries other than Germany, a foreign financial surplus exists because capital is imported (net) to fund the trade deficit. Further, there is a private-sector financial surplus because household savings exceed business investment. By definition, a government budget deficit must exist so all three net to zero: for example, the U.S. government budget deficit in 2011 was approximately 10% of GDP (8.6% of GDP of which was federal), offsetting a foreign financial surplus of 4% of GDP and a private-sector surplus of 6% of GDP. Wolf explained in July 2012 that the sudden shift in the private sector from deficit to surplus forced the U.S. government balance into deficit: "The financial balance of the private sector shifted towards surplus by the almost unbelievable cumulative total of 11.2 per cent of gross domestic product between the third quarter of 2007 and the second quarter of 2009, which was when the financial deficit of US government (federal and state) reached its peak.... No fiscal policy changes explain the collapse into massive fiscal deficit between 2007 and 2009, because there was none of any importance. The collapse is explained by the massive shift of the private sector from financial deficit into surplus or, in other words, from boom to bust." Wolf also wrote that several European economies face the same scenario and that a lack of deficit spending would likely have resulted in a depression. He argued that a private-sector depression (represented by the private- and foreign-sector surpluses) was being "contained" by government deficit spending. Economist Paul Krugman also explained in December 2011 the causes of the sizable shift from private-sector deficit to surplus in the U.S.: "This huge move into surplus reflects the end of the housing bubble, a sharp rise in household saving, and a slump in business investment due to lack of customers." One reason why austerity can be counterproductive in a downturn is due to a significant private-sector financial surplus, in which consumer savings is not fully invested by businesses. In a healthy economy, private-sector savings placed into the banking system by consumers are borrowed and invested by companies. However, if consumers have increased their savings but companies are not investing the money, a surplus develops. Business investment is one of the major components of GDP, for example, a U.S. private-sector financial deficit from 2004 to 2008 transitioned to a large surplus of savings over investment that exceeded $1 trillion by early 2009 and remained above $800 billion as of September 2012. Part of this investment reduction was related to the housing market, a major component of investment. This surplus explains how even significant government deficit spending would not increase interest rates (because businesses still have access to ample savings if they choose to borrow and invest it, so interest rates are not bid upward) and how Federal Reserve action to increase the money supply does not result in inflation (because the economy is awash with savings with no place to go). Economist Richard Koo described similar effects for several of the developed world economies in December 2011: "Today private sectors in the U.S., the U.K., Spain, and Ireland (but not Greece) are undergoing massive deleveraging [paying down debt rather than spending] in spite of record low interest rates. This means these countries are all in serious balance sheet recessions. The private sectors in Japan and Germany are not borrowing, either. With borrowers disappearing and banks reluctant to lend, it is no wonder that, after nearly three years of record low interest rates and massive liquidity injections, industrial economies are still doing so poorly. Flow of funds data for the U.S. show a massive shift away from borrowing to savings by the private sector since the housing bubble burst in 2007. The shift for the private sector as a whole represents over 9 percent of U.S. GDP at a time of zero interest rates. Moreover, this increase in private sector savings exceeds the increase in government borrowings (5.8 percent of GDP), which suggests that the government is not doing enough to offset private sector deleveraging." A typical goal of austerity is to reduce the annual budget deficit without sacrificing growth. Over time, this may reduce the overall debt burden, often measured as the ratio of public debt to GDP. During the European debt crisis, many countries embarked on austerity programs, reducing their budget deficits relative to GDP from 2010 to 2011. According to the CIA World Factbook, Greece decreased its budget deficit from 10.4% of GDP in 2010 to 9.6% in 2011. Iceland, Italy, Ireland, Portugal, France, and Spain also decreased their budget deficits from 2010 to 2011 relative to GDP but the austerity policy of the Eurozone achieves not only the reduction of budget deficits. The goal of economic consolidation influences the future development of the European Social Model. With the exception of Germany, each of these countries had public-debt-to-GDP ratios that increased from 2010 to 2011, as indicated in the chart at right. Greece's public-debt-to-GDP ratio increased from 143% in 2010 to 165% in 2011. Indicating despite declining budget deficits GDP growth was not sufficient to support a decline in the debt-to-GDP ratio for these countries during this period. Eurostat reported that the overall debt-to-GDP ratio for the EA17 was 70.1% in 2008, 80.0% in 2009, 85.4% in 2010, 87.3% in 2011, and 90.6% in 2012. Further, real GDP in the EA17 declined for six straight quarters from Q4 2011 to Q1 2013. Unemployment is another variable considered in evaluating austerity measures. According to the CIA World Factbook, from 2010 to 2011, the unemployment rates in Spain, Greece, Ireland, Portugal, and the UK increased. France and Italy had no significant changes, while in Germany and Iceland the unemployment rate declined. Eurostat reported that Eurozone unemployment reached record levels in March 2013 at 12.1%, up from 11.6% in September 2012 and 10.3% in 2011. Unemployment varied significantly by country. Economist Martin Wolf analyzed the relationship between cumulative GDP growth in 2008–2012 and total reduction in budget deficits due to austerity policies (see chart at right) in several European countries during April 2012. He concluded, "In all, there is no evidence here that large fiscal contractions budget deficit reductions bring benefits to confidence and growth that offset the direct effects of the contractions. They bring exactly what one would expect: small contractions bring recessions and big contractions bring depressions." Changes in budget balances (deficits or surpluses) explained approximately 53% of the change in GDP, according to the equation derived from the IMF data used in his analysis. Similarly, economist Paul Krugman analyzed the relationship between GDP and reduction in budget deficits for several European countries in April 2012 and concluded that austerity was slowing growth. He wrote: "this also implies that 1 euro of austerity yields only about 0.4 euros of reduced deficit, even in the short run. No wonder, then, that the whole austerity enterprise is spiraling into disaster." The Greek government-debt crisis brought a package of austerity measures, put forth by the EU and the IMF; it was met with great anger by the Greek public, leading to riots and social unrest. On 27 June 2011, trade union organizations began a 48-hour labour strike in advance of a parliamentary vote on the austerity package, the first such strike since 1974. Massive demonstrations were organized throughout Greece, intended to pressure members of parliament into voting against the package. The second set of austerity measures was approved on 29 June 2011, with 155 out of 300 members of parliament voting in favor. However, one United Nations official warned that the second package of austerity measures in Greece could pose a violation of human rights. Around 2011, the IMF started issuing guidance suggesting that austerity could be harmful when applied without regard to an economy's underlying fundamentals. In 2013 it published a detailed analysis concluding that "if financial markets focus on the short-term behavior of the debt ratio, or if country authorities engage in repeated rounds of tightening in an effort to get the debt ratio to converge to the official target," austerity policies could slow or reverse economic growth and inhibit full employment. Keynesian economists and commentators such as Paul Krugman have suggested that this has in fact been occurring, with austerity yielding worse results in proportion to the extent to which it has been imposed. In April and May 2012, France held a presidential election in which the winner, François Hollande, had opposed austerity measures, promising to eliminate France's budget deficit by 2017 by canceling recently enacted tax cuts and exemptions for the wealthy, raising the top tax bracket rate to 75% on incomes over one million euros, restoring the retirement age to 60 with a full pension for those who have worked 42 years, restoring 60,000 jobs recently cut from public education, regulating rent increases, and building additional public housing for the poor. In the legislative elections in June, Hollande's Socialist Party won a supermajority capable of amending the French Constitution and enabling the immediate enactment of the promised reforms. Interest rates on French government bonds fell by 30% to record lows, fewer than 50 basis points above German government bond rates. Latvia's economy returned to growth in 2011 and 2012, outpacing the 27 nations in the EU, while implementing significant austerity measures. Advocates of austerity argue that Latvia represents an empirical example of the benefits of austerity, while critics argue that austerity created unnecessary hardship with the output in 2013 still below the pre-crisis level. According to the CIA World Fact Book, "Latvia's economy experienced GDP growth of more than 10% per year during 2006–07, but entered a severe recession in 2008 as a result of an unsustainable current account deficit and large debt exposure amid the softening world economy. Triggered by the collapse of the second largest bank, GDP plunged 18% in 2009. The economy has not returned to pre-crisis levels despite strong growth, especially in the export sector in 2011–12. The IMF, EU, and other international donors provided substantial financial assistance to Latvia as part of an agreement to defend the currency's peg to the euro in exchange for the government's commitment to stringent austerity measures. The IMF/EU program successfully concluded in December 2011. The government of Prime Minister Valdis Dombrovskis remained committed to fiscal prudence and reducing the fiscal deficit from 7.7% of GDP in 2010, to 2.7% of GDP in 2012." The CIA estimated that Latvia's GDP declined by 0.3% in 2010, then grew by 5.5% in 2011 and 4.5% in 2012. Unemployment was 12.8% in 2011 and rose to 14.3% in 2012. Latvia's currency, the Lati, fell from $0.47 per U.S. dollar in 2008 to $0.55 in 2012, a decline of 17%. Latvia plans to enter the euro zone in 2014. Latvia's trade deficit improved from over 20% of GDP in 2006 to 2007 to under 2% GDP by 2012. Eighteen months after harsh austerity measures were enacted (including both spending cuts and tax increases), economic growth began to return, although unemployment remained above pre-crisis levels. Latvian exports have skyrocketed and both the trade deficit and budget deficit have decreased dramatically. More than one-third of government positions were eliminated, and the rest received sharp pay cuts. Exports increased after goods prices were reduced due to private business lowering wages in tandem with the government. Paul Krugman wrote in January 2013 that Latvia had yet to regain its pre-crisis level of employment. He also wrote, "So we're looking at a Depression-level slump, and 5 years later only a partial bounceback; unemployment is down but still very high, and the decline has a lot to do with emigration. It's not what you'd call a triumphant success story, any more than the partial US recovery from 1933 to 1936 – which was actually considerably more impressive – represented a huge victory over the Depression. And it's in no sense a refutation of Keynesianism, either. Even in Keynesian models, a small open economy can, in the long run, restore full employment through deflation and internal devaluation; the point, however, is that it involves many years of suffering". Latvian Prime Minister Valdis Dombrovskis defended his policies in a television interview, stating that Krugman refused to admit his error in predicting that Latvia's austerity policy would fail. Krugman had written a blog post in December 2008 entitled "Why Latvia is the New Argentina", in which he argued for Latvia to devalue its currency as an alternative or in addition to austerity. Austerity programs can be controversial. In the Overseas Development Institute (ODI) briefing paper "The IMF and the Third World", the ODI addresses five major complaints against the IMF's austerity conditionalities. Complaints include such measures being "anti-developmental", "self-defeating", and tending "to have an adverse impact on the poorest segments of the population". In many situations, austerity programs are implemented by countries that were previously under dictatorial regimes, leading to criticism that citizens are forced to repay the debts of their oppressors. In 2009, 2010, and 2011, workers and students in Greece and other European countries demonstrated against cuts to pensions, public services, and education spending as a result of government austerity measures. Following the announcement of plans to introduce austerity measures in Greece, massive demonstrations occurred throughout the country aimed at pressing parliamentarians to vote against the austerity package. In Athens alone, 19 arrests were made, while 46 civilians and 38 policemen had been injured by 29 June 2011. The third round of austerity was approved by the Greek parliament on 12 February 2012 and met strong opposition, especially in Athens and Thessaloniki, where police clashed with demonstrators. Opponents argue that austerity measures depress economic growth and ultimately cause reduced tax revenues that outweigh the benefits of reduced public spending. Moreover, in countries with already anemic economic growth, austerity can engender deflation, which inflates existing debt. Such austerity packages can also cause the country to fall into a liquidity trap, causing credit markets to freeze up and unemployment to increase. Opponents point to cases in Ireland and Spain in which austerity measures instituted in response to financial crises in 2009 proved ineffective in combating public debt and placed those countries at risk of defaulting in late 2010. In October 2012, the IMF announced that its forecasts for countries that implemented austerity programs have been consistently overoptimistic, suggesting that tax hikes and spending cuts have been doing more damage than expected and that countries that implemented fiscal stimulus, such as Germany and Austria, did better than expected. This data has been scrutinized by the Financial Times, which found no significant trends when outliers like Germany and Greece were excluded. Determining the multipliers used in the research to achieve the results found by the IMF was also described as an "exercise in futility" by Professor Carlos Vegh of the University of Michigan. Moreover, Barry Eichengreen of the University of California, Berkeley and Kevin H. O'Rourke of Oxford University write that the IMF's new estimate of the extent to which austerity restricts growth was much lower than historical data suggests. On 3 February 2015 Joseph Stiglitz wrote : "Austerity had failed repeatedly from its early use under US president Herbert Hoover, which turned the stock-market crash into the Great Depression, to the IMF programs imposed on East Asia and Latin America in recent decades. And yet when Greece got into trouble it was tried again." Government spending actually rose significantly under Hoover, while revenues were flat. Strategies that involve short-term stimulus with longer-term austerity are not mutually exclusive. Steps can be taken in the present that will reduce future spending, such as "bending the curve" on pensions by reducing cost of living adjustments or raising the retirement age for younger members of the population, while at the same time creating short-term spending or tax cut programs to stimulate the economy to create jobs. IMF managing director Christine Lagarde wrote in August 2011, "For the advanced economies, there is an unmistakable need to restore fiscal sustainability through credible consolidation plans. At the same time we know that slamming on the brakes too quickly will hurt the recovery and worsen job prospects. So fiscal adjustment must resolve the conundrum of being neither too fast nor too slow. Shaping a Goldilocks fiscal consolidation is all about timing. What is needed is a dual focus on medium-term consolidation and short-term support for growth. That may sound contradictory, but the two are mutually reinforcing. Decisions on future consolidation, tackling the issues that will bring sustained fiscal improvement, create space in the near term for policies that support growth." Federal Reserve Chair Ben Bernanke wrote in September 2011, "the two goals—achieving fiscal sustainability, which is the result of responsible policies set in place for the longer term, and avoiding creation of fiscal headwinds for the recovery—are not incompatible. Acting now to put in place a credible plan for reducing future deficits over the long term, while being attentive to the implications of fiscal choices for the recovery in the near term, can help serve both objectives." The term "age of austerity" was popularized by British Conservative leader David Cameron in his keynote speech to the Conservative Party forum in Cheltenham on 26 April 2009, in which he committed to end years of what he called excessive government spending. Merriam-Webster's Dictionary named the word "austerity" as its "Word of the Year" for 2010 because of the number of web searches this word generated that year. According to the president and publisher of the dictionary, "austerity had more than 250,000 searches on the dictionary's free online [website] tool" and the spike in searches "came with more coverage of the debt crisis". According to economist David Stuckler and physician Sanjay Basu in their study The Body Economic: Why Austerity Kills, a health crisis is being triggered by austerity policies, including up to 10,000 additional suicides which have occurred across Europe and the U.S. since the introduction of austerity programs. That is, the austerity measures are counterproductive in the short-run, as long as the multiplier is larger than a certain level . This erosion of the tax base is the effect of the endogenous component of the deficit. Therefore, if the government increases sales taxes, then it reduces the tax base due to its negative effect on the demand. And it upsets the budget balance. Supporters of austerity measures tend to use the metaphor that a government's debt is like a household's debt. They intend to frighten people that the government's overspending leads to the government's default. But this metaphor is wrong. For a country which has its own currency, its government can create credits by itself, and its central bank can keep the interest rate close to or equal to the nominal risk-free rate. Former US Federal Reserve chairman Alan Greenspan says that the probability that the US defaults on its debt repayment is zero, because the US government can print money. FRB of St. Louis says that the US government's debt is denominated in USD and so the government never go bankrupt. ↑ "Austerity measure". Financial Times Lexicon. Retrieved 1 March 2013. ↑ Traynor, Ian; Katie Allen (11 June 2010). "Austerity Europe: who faces the cuts". London: Guardian News. Retrieved 29 September 2010. ↑ Wesbury, Brian S.; Robert Stein (26 July 2010). "Government Austerity: The Good, Bad And Ugly". Forbes. Archived from the original on 29 September 2010. Retrieved 29 September 2010. ↑ Krugman, Paul (15 April 2012). "Europe's Economic Suicide". The New York Times. 1 2 Laura D'Andrea Tyson (1 June 2012). "Confusion about the Deficit". New York Times. Retrieved 16 May 2013. ↑ Paul Krugman (6 June 2013). "How the Case for Austerity Has Crumbled". New York Times. Retrieved 17 May 2013. ↑ Heard on Fresh Air from WHYY (4 October 2011). "NPR-Michael Lewis-How the Financial Crisis Created a New Third World-October 2011". Npr.org. Retrieved 7 July 2012. 1 2 Blyth, Mark (2013). Austerity: The History of a Dangerous Idea. New York: Oxford University Press. ISBN 019982830X. ↑ Zandi, Mark. "A Second Quick Boost From Government Could Spark Recovery." Edited excerpts from congressional testimony 24 July 2008. ↑ "CBO ranks Democratic and Republican stimulus proposals in one chart". Washington Post. ↑ "Congressional Budget Office Report Proves Spending Cuts Won't Boost Economic Growth - ThinkProgress". 1 2 "The balance sheet recession in the US". Financial Times. ↑ "We still have that sinking feeling". Financial Times. 1 2 3 "The World Factbook". ↑ Aaron Smith (31 October 2012). "Eurozone unemployment hits record high". CNNMoney. ↑ "The impact of fiscal austerity in the eurozone". Financial Times. ↑ http://www.telegraph.co.uk/finance/financialcrisis/9662285/Greeks-clash-with-riot-police-as-politicans-pass-austerity-measures.html "Greeks clash with riot police as politicians pass austerity measures"
↑ http://www.nytimes.com/2011/06/29/world/europe/29greece.html?_r=0 "Two-Day Strike in Greece Ahead of Austerity Vote"
↑ http://www.skai.gr/news/greece/article/170468/oi-aganaktismenoi-diadilonoun-stis-ellinikes-poleis-/ "Στα χνάρια των Ισπανών αγανακτισμένων (in Greek)"
↑ http://www.businessinsider.com/how-to-follow-the-greek-voting-2011-6 "Greek Government Wins Huge Austerity Vote"
↑ "Greek austerity measures could violate human rights, UN expert says". United Nations. 30 June 2011. Retrieved 3 July 2011. 1 2 "The World Factbook". 1 2 "Why The IMF's Decision To Agree A Lavian Bailout Programme Without Devaluation Is A Mistake". ↑ "IMF Survey : Latvia's Recovery Continues As It Eyes Euro Adoption". ↑ Kyriakidou, Dina (4 August 2010). "In Greece you get a bonus for showing up for work – Arcane benefits add billions to Greece's bloated budget". Toronto Star. Toronto. Retrieved 29 September 2010. ↑ Costas Kantouris and Nicholas Paphitis (10 September 2011). "Greek police, firefighters protest". The Boston Globe. Associated Press Sm,meme,emme,e,e,e. Retrieved 29 September 2011. ↑ Leung, Sophie (11 November 2010). "Stiglitz Says Ireland Has Bleak Prospect of Cutting Deficit, Saving Banks". Bloomberg. Retrieved 1 July 2011. ↑ Giles, Chris. "Robustness of IMF data scrutinised". Financial Times. Retrieved 6 December 2012. ↑ "A Greek Morality Tale". Project Syndicate. ↑ "Hoover Was No Budget Cutter". The Atlantic. ↑ "Don't let fiscal brakes stall global recovery". Financial Times. ↑ Deborah Summers (26 April 2009). "David Cameron warns of 'new age of austerity'". The Guardian. . Archived from the original on 29 April 2009. Retrieved 26 April 2009. ↑ M. Nicolas Firzli & Vincent Bazi. "Infrastructure Investments in an Age of Austerity : The Pension and Sovereign Funds Perspective". Revue Analyse Financière, volume 41 (Q4 2011 ed.). Retrieved 30 July 2011. ↑ Contreras, Russell (20 December 2010). "Audacity of 'austerity,' 2010 Word of the Year". Associated Press. Retrieved 20 December 2010. ↑ Why Austerity Kills: From Greece to U.S., Crippling Economic Policies Causing Global Health Crisis. Democracy Now!. 21 May 2013. Look up austerity in Wiktionary, the free dictionary. How Austerity Kills. The New York Times. 12 May 2013. Austerity’s Greek Death Toll: Study Connects Strict Measures to Rise in Suicides. Truthdig. February 4, 2015. Hundreds of mental health experts issue rallying call against austerity. The Guardian. April 17, 2015. Life Under Austerity. Jacobin. July 12, 2015. Austerity policies do more harm than good, IMF study concludes. The Guardian. May 27, 2016.